Advantages Of A Burglar Alarm System | Calgary Alarm Inc.
Burglar alarm systems provide many benefits to homeowners and business owners alike. The most valuable thing that they offer is the protection of your family or employees, reducing the chance that your home or business will be targeted by a burglar. Not only could you lose valuable items, but you could also become a victim of a home invasion, a potentially life-threatening situation. In 2016, crime increased in Calgary by 30-percent—the largest increase in crime in all of Canada. Breaking and entering, for example, increased to 9,168 cases in 2016. This is a frightening statistic and shows that now is the time to invest in a security alarm system for your home. Burglar alarms act as a deterrent; studies show that homes without a security system in place are more than 300 times more likely to become a victim of a burglary. In short, burglar alarm systems make you, your family and pets much more safe while also protect your valuables. Burglar alarms don’t only protect you against the threat of burglaries and home invasions. Depending on the system, they can also protect you against fires, carbon monoxide and floods. Investing in a monitoring service that will monitor your home on a 24/7 basis and contact emergencies services on your behalf is invaluable. Sometimes, stress can put us into panic mode and we fail to act quickly enough. We may also be put into a situation where can we cannot access a phone to call 9-11. This type of service is extremely valuable to seniors living at home who may have mobility issues and are not able to act quickly in the event of an emergency. 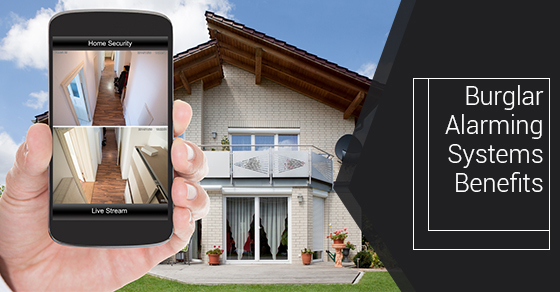 Depending upon your alarm system, you can monitor your home while on vacation since smart security alarms connect to WiFi. The peace of mind that burglar alarms offer is invaluable. You can’t put a price on knowing that your loved ones and your home are safe. Consider Calgary Alarms for your choice of monitoring service—we are one of the best security alarm monitoring companies in Canada. Contact us today for more.